The Indian Citizenship Act of 1924, also known as the Snyder Act, was proposed by Representative Homer P. Snyder (R) of New York and granted full U.S. citizenship to the indigenous peoples of the United States, called “Indians” in this Act. While the Fourteenth Amendment to the United States Constitution defines as citizens any persons born in the U.S. and subject to its jurisdiction, the amendment had been interpreted to not apply to Native people. The act was signed into law by President Calvin Coolidge on June 2, 1924. It was enacted partially in recognition of the thousands of Indians who served in the armed forces during the First World War. They [the Indian tribes] may without doubt, like the subjects of any foreign government, be naturalized by the authority of Congress and become citizens of a state and of the United States, and if an individual should leave his nation or tribe, and take up his abode among the white population, he would be entitled to all the rights and privileges which would belong to an emigrant from any other foreign people. In 1868, under the 14th Amendment, all persons “born or naturalized in the United States, and subject to the jurisdiction thereof” were declared citizens. However, the jurisdiction requirement was interpreted to exclude most Native Americans, and in 1870, the Senate Judiciary Committee further clarified the matter: “the 14th amendment to the Constitution has no effect whatever upon the status of the Indian tribes within the limits of the United States”. About eight percent of the Native population at the time qualified for U.S. citizenship due to being “taxed”. Others obtained citizenship by serving in the military, marrying whites or accepting land allotments, such as those granted under the Dawes Act. The exclusion of Native people from US citizenship was further established by Elk v. Wilkins, 112 U.S. 94 (1884), when the Court held that a Native person born a citizen of a recognized tribal nation was not born an American citizen and did not become one simply by voluntarily leaving his tribe and settling among whites. The syllabus of the decision explained that a Native person “who has not been naturalized, or taxed, or recognized as a citizen either by the United States or by the state, is not a citizen of the United States within the meaning of the first section of the Fourteenth Article of Amendment of the Constitution”. Even Native Americans who were granted citizenship rights under the 1924 Act may not have had full citizenship and suffrage rights until 1948. According to a survey by the Department of Interior, seven states still refused to grant Indians voting rights in 1938. Discrepancies between federal and state control provided loopholes in the Act’s enforcement. States justified discrimination based on state statutes and constitutions. Three main arguments for Indian voting exclusion were Indian exemption from real estate taxes; maintenance of tribal affiliation; and the notion that Indians were under guardianship, or lived on lands controlled by federal trusteeship. :121 By 1947 all states with large Indian populations, except Arizona and New Mexico, had extended voting rights to Native Americans who qualified under the 1924 Act. Finally, in 1948, the states withdrew their prohibition on Indian voting because of a judicial decision. Under the 1924 Act, indigenous people did not have to apply for citizenship, nor did they have to give up their tribal citizenship to become a U.S. citizen. Most tribes had communal property, and to have a right to the land, individual Indian people needed to belong to the tribe. Thus, dual citizenship was allowed. Earlier views on granting Indian citizenship had suggested allocating land to individuals. Of such efforts, the Dawes Act was the most prominent. That Act allocated once-tribally-owned land to individual tribal members, and because they were landowners and eventually would pay taxes on the land and become “proficient members of society”, they could be granted citizenship. This idea was presented by a group of white American citizens, called “Friends of the Indian”, who lobbied for the assimilation of indigenous people into American society. They specifically hoped to do that by elevating indigenous people to the status of US citizens. Though the Dawes Act allocated land, the notion that this should be directly tied to citizenship was abandoned in the early 20th century in favor of a more direct path to American citizenship. Although some white citizen groups were supportive of Indian citizenship, Indians themselves were mixed in the debate. Those who supported it considered the Act a way to secure a long-standing political identity. Those who rejected it were worried about tribal sovereignty and citizenship. Many leaders in the Native American community at the time, like Charles Santee, a Santee Sioux, were interested in Native American integration into the larger society but adamant about preserving the Native American identity. Many were also reluctant to trust the government that had taken their land and discriminated so violently against them. One group who opposed the Bill was the Onondaga Nation. They believed acceptance of this act was “treason” because the United States Senate was forcing citizenship on all Indians without their consent. According to the Iroquois, the Bill disregarded previous treaties between the Indian Tribes and the United States, specifically the 1784 Treaty of Fort Stanwix, the 1789 Treaty of Fort Harmor, and the 1794 Treaty of Canandaigua in which the Iroquois were recognized as “separate and sovereign.” The removal of the word “full” from “full citizenship” in the text of the original bill was used as a reason why some Native Americans were not granted the immediate right to vote with the bill. On May 19, 1924, Snyder said on the House Floor, “The New York Indians are very much opposed to this, but I am perfectly willing to take the responsibility if the committee sees fit to agree to this.” After passage of the bill, Snyder became the representative of some of these Indians. 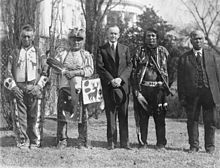 With little lobbying effort from Native Americans themselves, two primarily white groups shaped the law: Progressive senators and activists, like the “Friends of the Indians”. Progressive senators on the Senate Indian Affairs Committee were for the Act because they thought it would reduce corruption and inefficiency in the Department of Interior and the Bureau of Indian Affairs. Such institutions would no longer be in control of citizenship regulations if citizenship were automatically granted to all indigenous people. They also hoped to empower Indians by citizenship. Other groups for Native American citizenship supported it because of the “guardianship” status they felt the US government should take to protect indigenous people. They worried Indians were being taken advantage of by non-indigenous Americans for their land. They advocated that the government had an obligation to supervise and protect native citizens. The Indian Rights Association, a key group in the development of this legislation, advocated that federal guardianship was a necessary component of citizenship. They pushed for the clause “tribal rights and property” in the Indian Citizenship Act to preserve Indian identity but gain citizenship rights and protection. The Indian, though a man without a country, the Indian who has suffered a thousand wrongs considered the white man’s burden and from mountains, plains and divides, the Indian threw himself into the struggle to help throttle the unthinkable tyranny of the Hun. The Indian helped to free Belgium, helped to free all the small nations, helped to give victory to the Stars and Stripes. The Indian went to France to help avenge the ravages of autocracy. Now, shall we not redeem ourselves by redeeming all the tribes? Nipo T. Strongheart, a performer-lecturer on Native American topics at Lyceum and Chautauqua and similar activities across the United States from 1917 to the 1920s, gathered signatures on petitions supporting Indian enfranchisement into the tens of thousands. Some of his trips into Pennsylvania were in support of Melville Clyde Kelly, a supporter of the bill in Congress, who had a district there. The petitions and other advocacy work helped pass the bill, but he was disillusioned with the results. ^ a b c d NCC Staff (June 2, 2015). “On this day in 1924: All Indians made United States citizens”. National Constitution Center. Retrieved 5 September 2015. ^ “1924 Indian Citizenship Act” (PDF). National Park Service. Retrieved 5 September 2015. ^ a b Peterson, Helen L. (May 1957). “American Indian Political Participation”. American Academy of Political and Social Science. 311 (1): 116–121. doi:10.1177/000271625731100113. ^ Haas, Theodore (1957). “The Legal Aspects of Indian Affairs from 1887 to 1957”. American Academy of Political and Social Science: 12–22. ^ a b c d e Bruyneel, Kevin (2004). “Challenging American Boundaries: Indigenous People and the ‘Gift’ of U.S. Citizenship”. Studies in American Political Development. 18 (1): 30–43. ^ Prengaman, Kate (August 10, 2014). “Pride for his people – New displays at Toppenish museum celebrate life and influence of Nipo Strongheart, a Yakama with a passion for Indian rights”. Yakima Herald-Republic. Yakima Washington. Peters, Gerhard; Woolley, John T. “Calvin Coolidge: “Radio Address from the White House on the Duties of Citizenship,” November 3, 1924″. The American Presidency Project. University of California – Santa Barbara.